Patented airtight Triple Lock® construction. Available in lengths to 50ft in 5 foot increments. 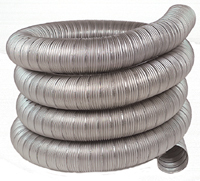 Available in 3" through 24" diameters. UL 1777 and ULC S635 Listed for use with wood, pellet, oil, natural gas and propane fired appliances.